1.Heat medium saucepot of water to a boil over high heat; add eggs and return to a boil. Reduce heat to medium-low; simmer 6 minutes. Remove with a slotted spoon to bowl of ice water; let cool 1 minute. 2.In medium bowl, with back of fork, coarsely mash chickpeas with reserved liquid, turmeric, paprika, cumin, salt and pepper, leaving some chickpeas whole. 3.In large skillet, heat oil over medium-high heat. Add onion; cook 4 minutes or until softened, stirring occasionally. Add garlic; cook 30 seconds, stirring frequently. Add mushrooms; cook 5 minutes or until mushrooms are tender and have released their moisture, stirring occasionally. Add chickpea mixture; cook 5 minutes, stirring occasionally. Makes about 3 cups. 4.Carefully peel eggs. 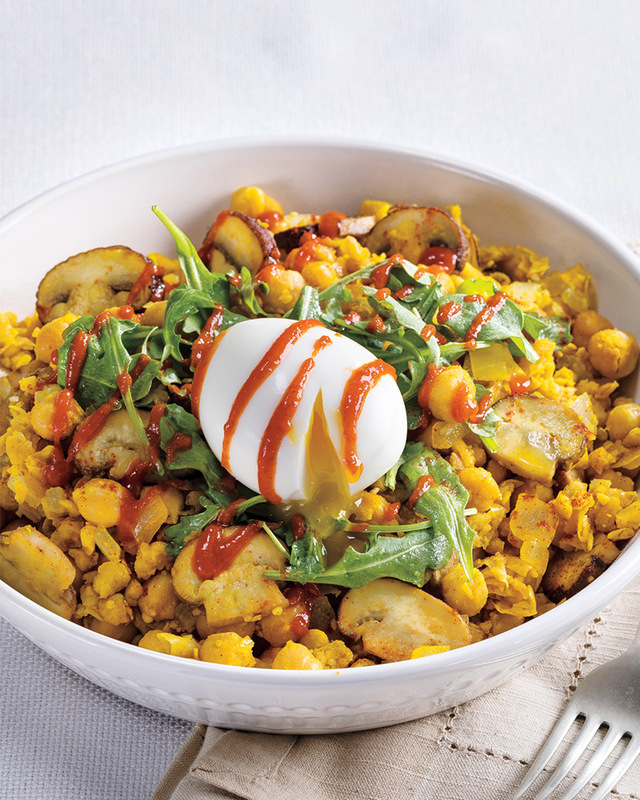 Divide chickpea mixture into 4 shallow bowls; top with arugula and eggs, and drizzle with sriracha. > Serve without the egg for a delicious, protein-packed vegan breakfast. Make it a meal by serving with whole grain toast. Top with grape tomatoes and garnish with green onion.